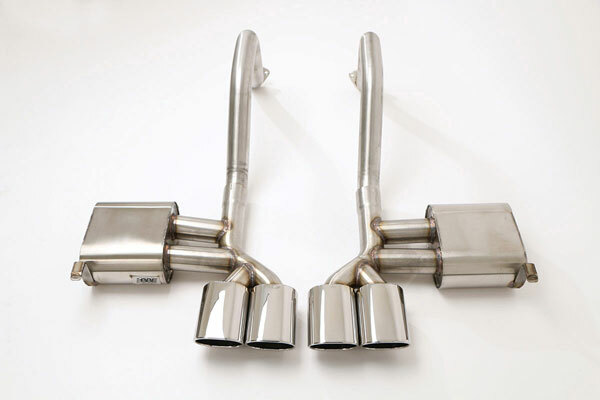 B&B Billy Boat Exhaust FCOR-0205 - B&B PRT Exhaust System with Quad Oval Tips Corvette C5; 1997-2004. The Billy Boat Performance Exhaust PRT after-cat system employs exhaust technology unique to the aftermarket. So unique, in fact, it doesn&apos;t use a muffler at all. The Billy Boat Performance Exhaust PRT system is simple in design, though more complex in theory, which suggests that you can have a mellow sound at cruising speeds and a sport note when you&apos;re tearing up the streets. It allows true straight through exhaust passage under aggressive driving conditions, through a mellow sound is emitted at cruising speeds thanks to the unique Purge Chamber. This Billy Boat Performance Exhaust PRT system works purely on physics without mechanical devices to direct exhaust flow. Using our in-house Dynojet chassis dyno on a 2001 6-speed with a Billy Boat Performance Exhaust PRT system show gains of 12 additional horsepower and 14 lbs/ft of torque. What&apos;s cool about the Billy Boat Performance Exhaust PRT system is its decidedly Dr. Jekyll and Mr. Hyde nature. You can cruise down the highway, in overdrive, at extra-legal speeds and be totally unaware of the monster that lurks beneath. Hammer the throttle and the beast is awakened, roaring like AJ Foyt on too much caffeine. 4 1/2" Quad-Rolled OVAL Tips. Mandrel bent from the highest-grade T-304 stainless steel. Designed, tested, and manufactured to the finest hand-made integrity found in any exhaust system.